Summer’s can be hot in the Northwest (no, really) and Friday night was no exception. I had a fridge full of fresh vegetables and figured making a salad would be the best option for dinner. 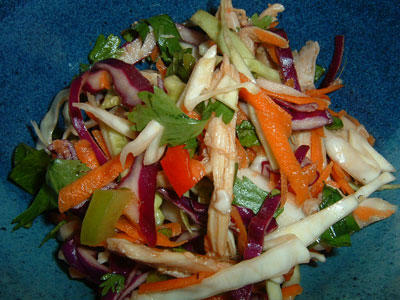 I decided to make Nigella’s Vietnamese Chicken and Mint Salad since I had all the ingredients needed and more. I had 3 free range chicken thighs in the fridge that needed tending to, so I put the chicken in water along with a few dried chili peppers, kafir lime leaves and a few dashes of fish sauce and set the whole lot to simmer. Once the chicken was cooked, i left them to cool in the fridge and I put the cooking liquid away in the freezer for another day. I started by chopping up ½ a small green cabbage and ½ of a small purple cabbage into fine shreds and threw it into a large bowl. Next, I grated 2 large carrots and threw that on top of the cabbage. The green onions, ½ of a red and ½ of a green pepper were next and I chopped those up too. I rolled up a large handful of mint leaves into a cigar shape and cut that into a lovely chiffonade (!!) and tore off some Italian parsley off of their stems and threw them in too. The final step was shredding up my chicken thighs and then with my clean hands, I mixed everything all up and started on the dressing. I followed the dressing pretty faithfully to Nigella’s recipe, but I subsitituted the rice vinegar for some red wine vinegar since it was all that I had. Once it was shaken up, I added it to the salad and me and Cornelius dug in. The next day I ate the some leftovers with some crushed peanuts on top for added crunch. Tasty! Kickpleat, thank you for calling this Nigella recipe to my attention! I made it last night, and it was absolutely lip-smacking delicious! I had leftovers at work today for lunch (with my favorite chopsticks, brought from home), and I think there’s even enough left for tomorrow…it’s so tasty, I don’t even care if it’s a tad soggy. Mmmm! Glad you tried it! It is a simple and delicious recipe and it’s definitely one of my favorite salads. It’s so pretty to eat as well so I’m sure it not only tasted lovely but looked great with your pretty chopsticks! Thank you for this fabulous recipe! I made it for a family dinner, and my mom said it was her favorite dish I ever made. I used fresh mint from our garden, and made a couple other changes. I added some coconut milk and green Thai curry paste to the dressing to add a Thai twist to the salad. I also added grilled chicken and mung bean noodles to make it more of a meal. It is very unique, and will become one of my signature recipes. Diane, I’m so glad you liked it and your additions sound wonderful!